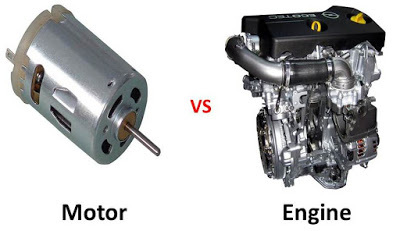 Today I am going to tell you about difference between motor and engine. We have heard the word motor and engine many times but most of us doesn’t know significant difference between them. The term engine is use for any device or mechanical unit which converts heat energy into mechanical energy. Mostly heat is taken by burning of fuel. It is mostly used in automobile industries and many other industrial works. Motor is an electrical device which converts electric energy into mechanical energy. It is used in many household devices like fen, juicer etc. The basic and main difference between motor and engine is that engine converts chemical energy of fuel into mechanical energy whereas motor converts electrical energy into mechanical energy. Both these devices used for develop mechanical motion. There are many other hidden differences which are described as follow. It converts chemical energy into mechanical energy. It is run by fuel. It is run by electricity. Engine needs lubrication for continuous running. It is generally a piston cylinder device. Motor is an arrangement of coil and rotor. For the equal power engines are heavier then motor. Motor are lighter than engines. Efficiency of motor is high. It generate lot of sound during converting energy. Today we have learnt about difference between motor and engine. If you have any query, ask by commenting. Thanks for reading it.